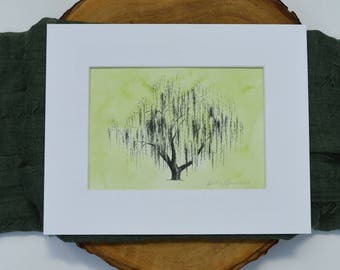 Custom Pen & Ink Drawings, Savannah Watercolor Prints, Mossy Live Oak Trees, Wedding Thumbprint Tree Guestbooks, Invitations, Stationery and whatever else inspires! *I try my best to respond to inquiries on the weekends. That said, I'm also a Mommy and I value those precious Saturdays and Sundays with my little men. Please know that if you convo me on the weekend, and don't hear back right away, I'll respond to you promptly on Monday. Thanks for understanding! Residents of Georgia will be charged 7% sales tax. Falalalala! We are busy elves making ornaments in the shop today! Watch for sales all weekend long! So grateful to do what I love! Welcome to Fly Young Studio, I’m glad you’re here. This is my place for little line drawings, some with splashes of color, others printed on wood. 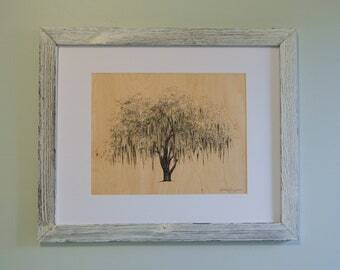 You’ll find these drawings on hand-painted prints, stationery and wedding paper goods throughout the shop. 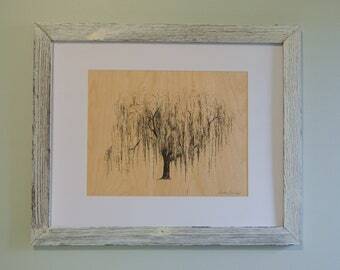 I especially love drawing trees, house portraits and capturing little memories on paper. Everything here is made with love and shipped with care. I'm eternally grateful to those of you who have helped to support my dream and spread the word about my work. You keep me inspired! I work from my home studio in Savannah, Georgia, where I live with my husband, our 2 little boys, and our rescue dog, Vayda. *I try my best to respond to inquiries on the weekends. That said, I'm also a Mommy and I value those precious Saturdays and Sundays with my little man. Please know that if you convo me on the weekend, and don't hear back right away, I'll respond to you promptly on Monday. Thanks for understanding! Heather studied illustration at the Savannah College of Art & Design. She currently resides in Savannah, with her husband Nicholas, their two sons, and their rescue dog, Vayda. 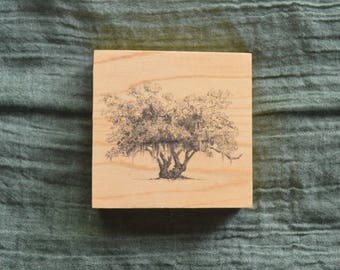 Camden Printing helps me print Oak Notes and Savannah Notes so my printer can run the specialty items, like wedding invitations and personalized stationery. 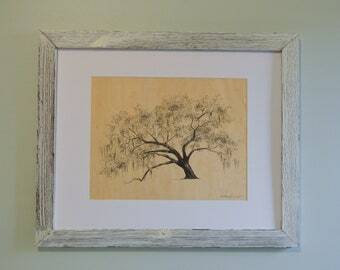 Savannah Blueprint prints any paper goods that exceed 13x19 inches. All other prints are printed in my home studio. Welcome to Fly Young Studio! I'm so happy you're here. 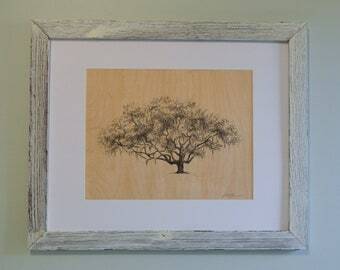 I specialize in pen and ink drawings of Trees, Architecture, Wedding Venues, and Landscapes. I love custom work and have a soft spot for hand-written notes, so you'll also find a bit of stationery and wedding paper-goods around here. If you have any questions at all, please don't hesitate to ask! If you are unsatisfied with your purchase, you may return your item within 14 days. You are responsible for shipping fees both ways. Your refund will be issued via paypal and will not be issued until the item has been returned in good condition. I reserve the right to refuse a refund should the artwork be damaged in any way. 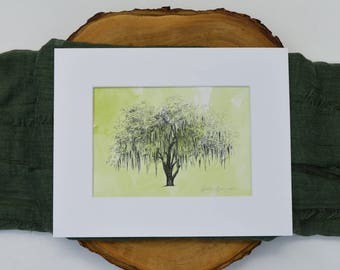 Thumbprint Trees, Wedding Invitations and Personalized Paper Goods, Custom Pen & Ink Drawings are non-returnable. I ship almost everything fully insured. So if your item arrives damaged in the mail, please take a moment to photograph the item and it's packaging so that I can have proof to file a claim with the mail service provider. I will gladly replace the damaged item promptly upon receiving your claim and photos. If you have any troubles at all making a purchase, please email me at heather [!at] flyoungstudio.com or call 912-308-3018 and I'll gladly walk you through the process. Prints ship via USPS First Class / Parcel Post within 3-5 business days of purchase. If you should need your order expedited, just convo me, and I'll see what I can do. I'm always happy to refund shipping overages. 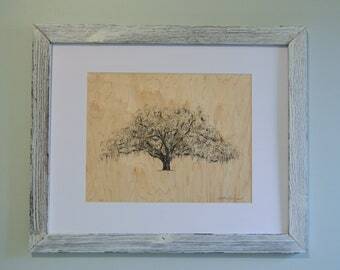 Thumbprint Trees and all other Custom orders require extra time, so be sure to convo me for an ETA before purchasing. Do you respond to messages after hours? We do try our best to respond after hours and on the weekends, but we do have families and sometimes life can get a little hectic! We will respond at the first opportunity we have, and you can always count on us for a quick reply when we are at the shop. Do you offer digital files for personally printing? No, we do not offer digital files alone at this time. 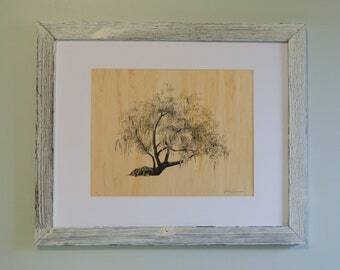 We value the high quality of our prints and know you will be happy with them too! What is your turn around on custom work? Please contact us directly to find out what our current turn around time is. It will vary depending on the complexity of your order and what other orders we have already received. We try to be as accommodating as possible, but during certain times of the year, especially the holidays, certain custom work may require a longer turn around. Yes, we are happy to ship to you wherever you may be. Buyer is responsible for any duties or customs fees. Yes! Please contact us at info [!at] flyyoungstudio.com for our line sheet and additional wholesale information.